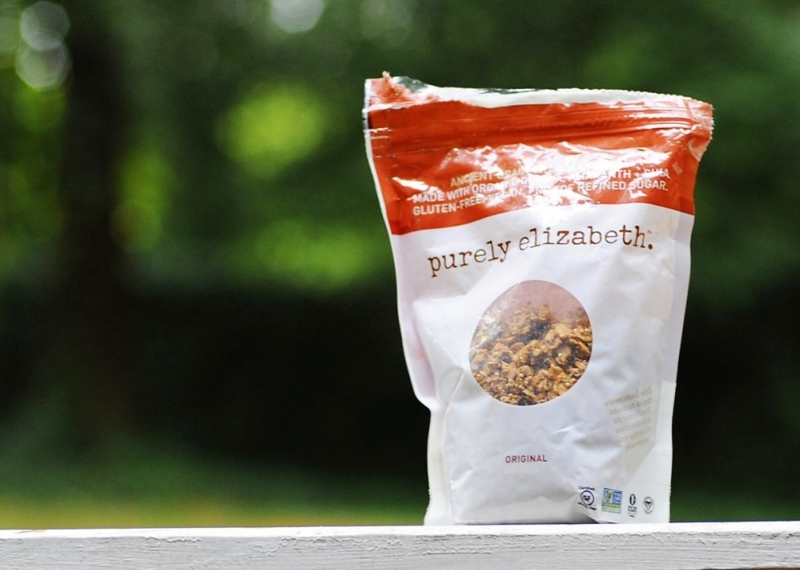 Have you ever tried Purely Elizabeth’s granola? If not, don’t. I’m not kidding. This stuff is ridiculously addictive! And at $8 a bag, that could be come an expensive habit. The other day, I bought this at Whole Foods for Tate as a treat since we had not had it in awhile. Bad idea…turns out it’s as addictive as ever! The sweet, salty, & cinnamon flavors are fantastic but I also love the simple and high quality ingredients. 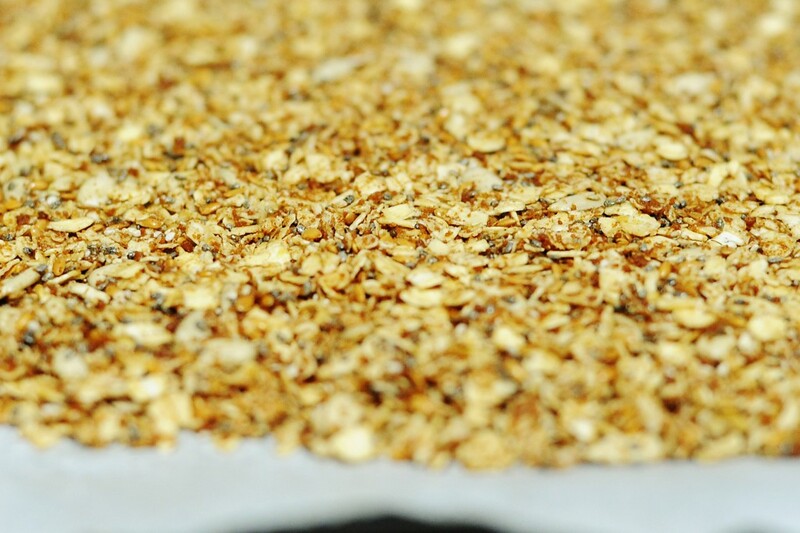 They do have gluten free oats in them and yes, I know, oats are not Paleo. But we all have to cheat once in awhile and as long as you can stick to the 90/10 general rule (paleo 90 percent of the time –gluten free 100 percent for me, cheat 10 percent), I’m not affected by it physically. And this stuff is so worth it. Tate took this picture. Not too bad for my 4 year old huh? But, it’s not always about me and I have no problem with my family eating this stuff once in awhile, other than the fact that it’s $8 a bag (and I have to hide it from myself!). So…I thought I can figure out how to make something similar (and a little more paleo) but it would probably take many tries to get it right. I have to brag and say, after the first time, it was really good!! So much so, we kept trying to put it in the oven, but everyone kept munching on it. I think we ate half the pan before we got to bake it! It’s that tasty!! What else is so great about this is it take 5 minutes to make, 10 to cook and it’s not messy (without the honey and/or nut butters), and it’s nut free for those with nut allergies, or for those attending school’s with a nut free rule. Mix it all together, place evenly on cookie sheet with parchment paper and cook on 350 for about 10 minutes, allow to cool for about 20, and enjoy! So easy you can get your kids to make it!! 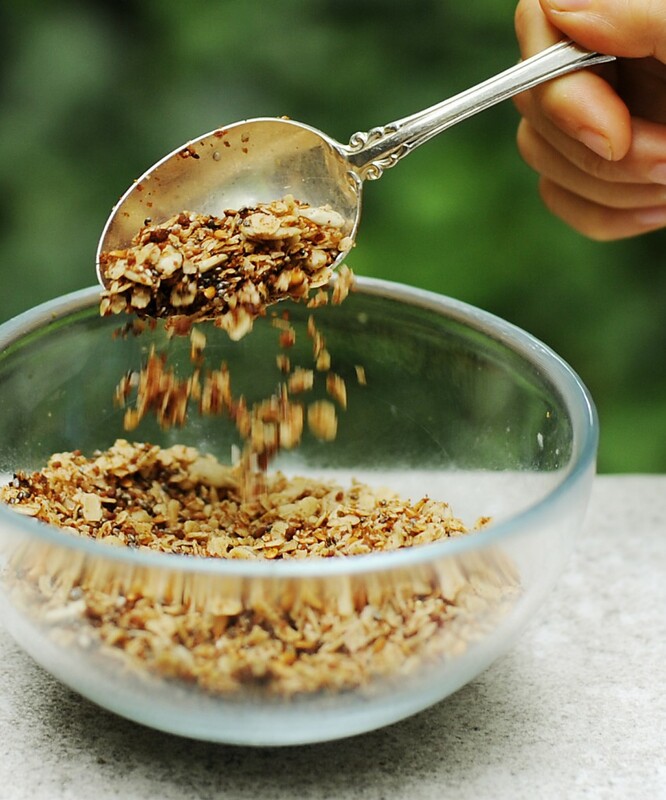 Oh with all of the flax and chia seeds, this should be called Omega-3 Granola but it doesn’t sound very catchy, does it? Any ideas so I can list it under my “recipes” section? I hope everyone had a fun and safe holiday weekend! !